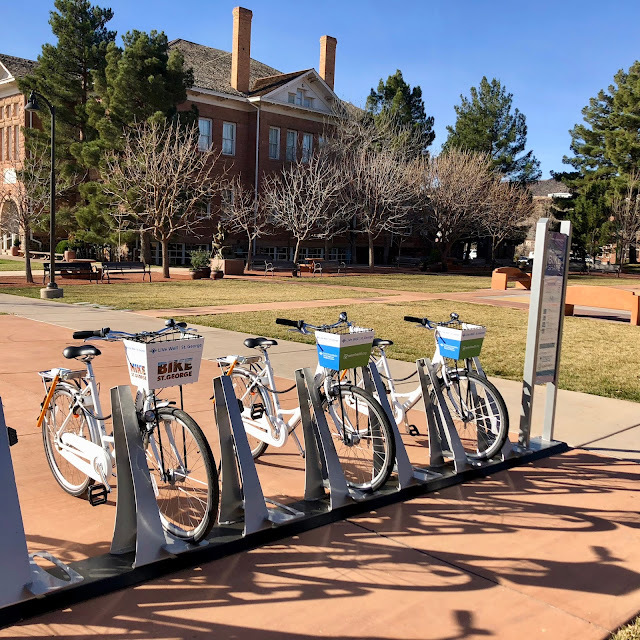 Southern Utah Attractions: Zagster Bike Share is Now in St. George, Utah! Zagster Bike Share is Now in St. George, Utah! 1. Find a Zagster Bike Share location. You can find a list here or find bikes near you using the Zagster app. 2. Download the Zagster app and join the Live Well St. George bike share. 3. Unlock the bike! Find the bike # on the back of the bike and enter it into the app. This will give you a code to unlock the bike! Use the on-bike keypad and enter the unique unlock code. Remove the docking cable from the side of the ring lock. 4. Ride! There are annual memberships and student annual memberships that you can use to save money. Otherwise it is $1/30 minutes and up to $40/ride. 5. Return the bike when you are done to any location! It does not need to be the location you got it from. Find a location by clicking here or use the Zagster app! 6. Lock the bike. On the right side of the bike there is an orange tab on the ring lock. Just slide it down! Place the docking cable from the station into the port on the ring lock. In the Zagster app hit end ride. That's it! Easy isn't it? You can find out more about this bike share program on their website by clicking here.